More so than any other plant I've looked at, this surely needs no introduction. 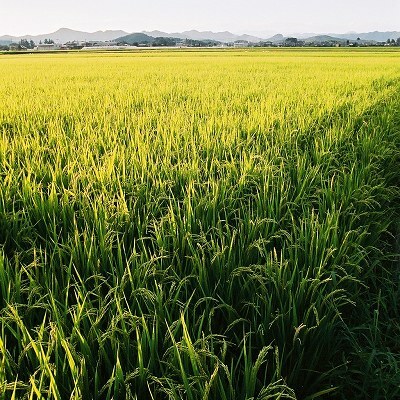 As a rough guess, something like 90% of the world's population must have tasted rice (Oryza sativa) at some point, and the historical record suggests it has been cultivated for upwards of 5000 years. Despite this familiarity, to someone growing up in northern Europe as I did, the paddy-field retains a certain air of mystery - though not much that a few photographs won't clear up. 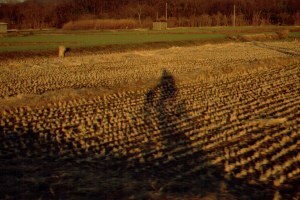 After harvest, the fields are ploughed or sometimes left as stubble for the entire winter. I suppose this is too far north to grow more than one rice crop in a season, but there is some double-cropping, using the same land first for spring-grown barley, then for rice in the summer. 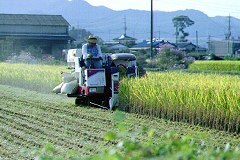 But in any case rice-planting happens quite late - around the beginning of June. 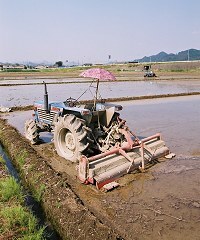 Preparing the paddy-field for planting is an interesting (and mucky) business. 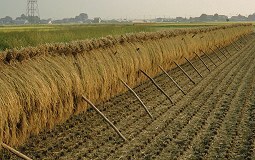 An elaborate network of channels and pipelines brings the water to flood the paddy-field and form a deep layer of soft mud, which has to be levelled so that all parts get the same treatment. As the two views above show, locations are extremely varied: the left photo, while not matching the rice terraces of the Philippines or Bali, is some way up a valley, whereas on the right we see Kato-san's paddy-field right in front of our house. This is where the frogs congregate to keep us awake on summer nights! The seedlings are grown in trays, in a sort of fibre matting, until they are ready for planting out. 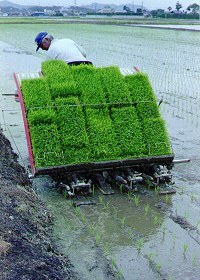 In the old days this job, taue, or paddy-planting, was a marathon back-breaker. Whole families were needed - Keiko remembers farming children being absent from school for a few days for it as late as the 1960s. But this has all changed, with the invention of machinery. The seedlings can be loaded from their trays into the chutes on this nifty little unit, then picking claws take successive nibbles from the slabs, scanning a bit like an inkjet printer working backwards. Then the summer. The growing plants thrive, as the sun beats down, the steamy humidity envelopes, and every agrochemical known to science is sprayed all over them. 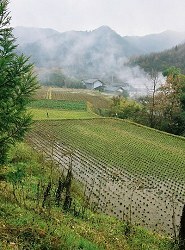 Just around harvest time comes the autumnal equinox, when splashes of red appear around the paddy-fields. 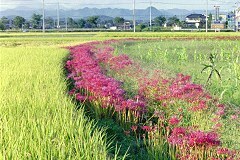 See my page on higanbana, or the red spider lily. Finally the harvest, in late September or early October. The overwhelming part of the crop is gobbled up by miniature combine harvesters, but for the very best flavour the old-fashioned way is said to be the best. So here and there you will see the cut sheaves of rice drying on these wooden frameworks. Everyone knows that the Eskimos have more than six hundred words for "snow"*, so it's no surprise that Japanese has more than one word for "rice". At the top of this page I've included two kanji: partly because they are the two basic words, for "rice" and "paddy-field", and also partly because they are rather beautiful inverses of each other. Imagine a 16-segment display, of the sort occasionally used to display the complete Roman alphabet; in the figure on the right, simply imagine alternating between black+green (the "star-shaped" character for rice) and black+blue (the "grid-shaped" character for paddy-field). At any rate, these characters are extremely easy to remember, and the paddy-field character is very common in family names, so if you have a collection of business cards from a trip to Japan, the chances are that you can find several instances among them. * They don't. See Mark Rosenfelder's linguistic myths FAQ, or read Geoff Pullum's book, "The Great Eskimo Vocabulary Hoax." 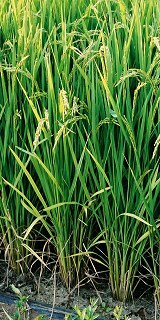 The word "paddy" comes from Malay padi, meaning simply "rice". Never too sure in English whether to say "rice-paddy", "paddy" or "paddy-field", I did some web research and found people describing the first of these as a terrible error. Of course there is a common usage of "paddy" to mean the field, but cowardice compelled me to go through and change every occurrence to "paddy-field". 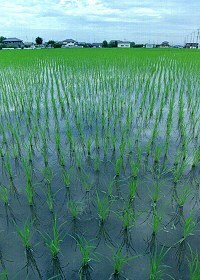 (The Shorter Oxford English Dictionary (1933) for example, gives only the meaning of "rice", and uses the word "paddy-field" without giving it a definition.) Anyway, here's a list of words in Japanese. kome: the basic word for the grain, in the uncooked state. 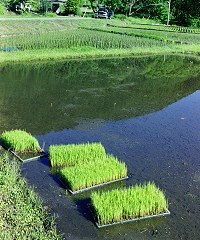 ine: refers to the growing rice plant. gohan: cooked rice - this word is also used to refer to meals in general. 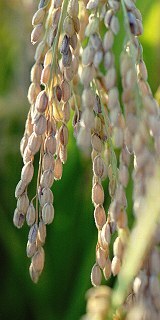 raisu: a loan from English, but refers to cooked rice only. The distinction from gohan is delicate: I've heard claims of a menu including both gohan and raisu, where the gohan comes in a bowl and the raisu on a plate. ta: the basic word, but not generally used on its own. 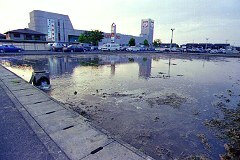 Common in names, where it often changes to da, as in Kawada, or Ishida. tanbo: the most usual colloquial term, as when mentioning to a neighbour that their child has just fallen in. suiden: this is really a loan word from Chinese, but it is the standard formal term in textbooks and so on. Note: The two characters at the top of the page ("kome + ta") are not intended to be read as a single word ("rice-field"). There is no compound kometa, although this combination does occur as a family name, usually read "Yoneda".